This is yet another Lucky Block mod for Minecraft PE by which you will experience good luck. 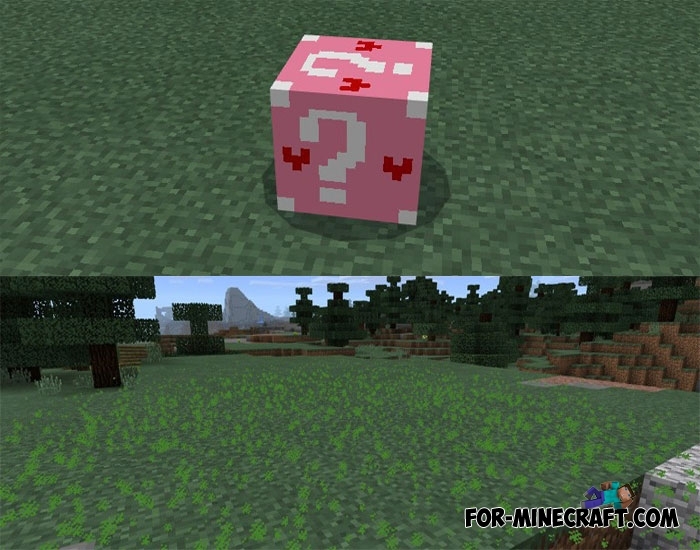 But this time Lucky Block is completely changed and is very different from similar ones. Dangerous block is a box which stores many different terrible surprises that will impress you. This mod works great in a mini game where players must break these boxes on the way. As a result, no one knows what happened in the end. New Lucky block spawns around the world, you just have to travel more and to destroy them. There are also spawn eggs (set the creative mode, and open ur inventory). Dangerous Lucky Block has a certain chance depends on your luck. You will get a lot expensive things if you are focused and believe in yourself. Otherwise, you are waiting for trouble such as aggressive mobs, explosions, effects, so be ready for it. Also on our website were added slightly different types of Lucky blocks. For example, by far the most popular lucky mod is the Lucky Block Addon. It is usually used as rewards in both single and in multiplayer modes. Lucky Block Addon v2.0 (MCPE 1.0/1.1)Probably every player knows about this addon..